I cannot comment on the 6×47 SM, since I have never worked with that, but I have shot the 6×47 Lapua (necked down 6.5 x 47 Lapua) and the 6XC. 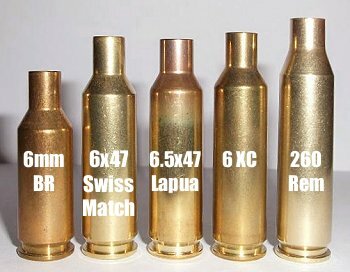 The 6XC Norma brass I have has excellent uniformity, but I have never found it to be as hard as the Lapua 6.5×47 Brass, nor have I found it to be as hard as formed Winchester 22/250 brass (which is what I use for stiffer 6XC 600 yard loads). I don’t think any of them have any particular advantage over another in the performance dept. as they are all so close in capacity. I found N160 to be a great powder for those cartridges. 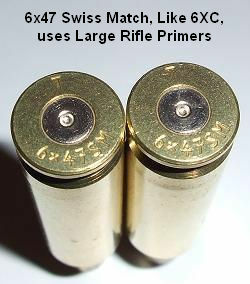 “Which is better, the 6XC or 6mm-6.5×47″. The correct answer seems to be “it depends”. … Well darn right it does. When I started working with the 6×47 Lapua, load data was still a bit hard to find, so I had no choice but to figure it out the hard way. I tested everything from IMR4198 to Reloader 19 trying to find a match for the 115 DTAC or Berger. I was frustrated because of the inconsistent results I found. Cold day hang fires and wild velocity variations from one day to the next drove me nuts, but I got it down to the nub and here’s the scoop. The small primer might be fine for faster powders used with lighter bullets, but the small primer in the native 6.5×47 Lapua case just does not quite have what it takes to consistently light 38.5 grains of 4350 or RL17 with 115s. (I think Mr. Tubbs knows this.) Since I was already stuck with a rifle chambered for 6×47 (not 6XC) I had to find a way to use large primers, so I formed some test cases from 22-250 brass and wouldn’t you know it, problem solved. Low and consistent SDs became the norm. After that I started making 6×47 cases from 6XC brass (because they’re shorter than 22-250). Now I get to use large primers which work great with the 115s and my SDs are under 5 fps running 3000 fps. Admittedly this process of sizing down 6XC cases is a minor pain, but the end result speaks for itself. I know it’s from 2009… but I’ve been shooting 41-42gr of H4350 in my 6x47L and have never experienced any problems with ignition. ES of 15 or less and SD of 2-3 depending on the load, and that’s at 3220fps with 105 hybrids. 6XC or 6x47L is a non-issue, pick your poison and go for it. People shooting an action with LR firing pin may want to go for the 6XC to be safe, or have their firing pins changed and a bushing installed in their bolt. This will indeed cause issues with ignition.